The 2018 MLB postseason begins on Tuesday, Oct. 2. That is just two weeks away! Boston was the first team to earn a playoff berth and though the Red Sox haven’t clinched the AL East yet, with an 11.5-game lead it is only a matter of time. Last Saturday, Cleveland locked up the AL Central for a third consecutive season. Outside of the AL East and AL Central, the rest of the divisions are up for grabs. The bookmakers at 5Dimes have posted odds on the division races. Which teams are offering bettors value? To find out, we created a consensus projection using simulations from Baseball Prospectus and FanGraphs. Then we compared the consensus projections to current lines. For example, the Brewers’ odds of winning the NL Central are +535. For us to feel comfortable wagering on Milwaukee, it would need to win the division 15.7% (which is 100/(100 +535)) of the time. According to our simulations, the Brew Crew has an 11.6% chance of winning the division crown, meaning there is no value in placing a bet at +535 odds. Based on the difference in implied probability and projected chance, there are seven bets, including team and field, offering value. The analysis below looks at the three best wagers. Atlanta is on a three-game skid following a season best six-game winning streak. The Braves play their next six games at home, but they have lost nine of their last 12 games at SunTrust Park. Does this make you want to lay -2000 odds? I mention this because none of it really matters when the team has a 6.5-game lead in one of the weakest divisions in baseball. The Braves finish the season with 10 games against their NL East rivals against whom they’ve gone 43-23 this season. The Astros’ magic number to clinch the division is down to nine. Houston’s on pace to win more than 100 games and is a ridiculous 52-22 on the road this season, which will come in handy as the team closes with consecutive series away from home. 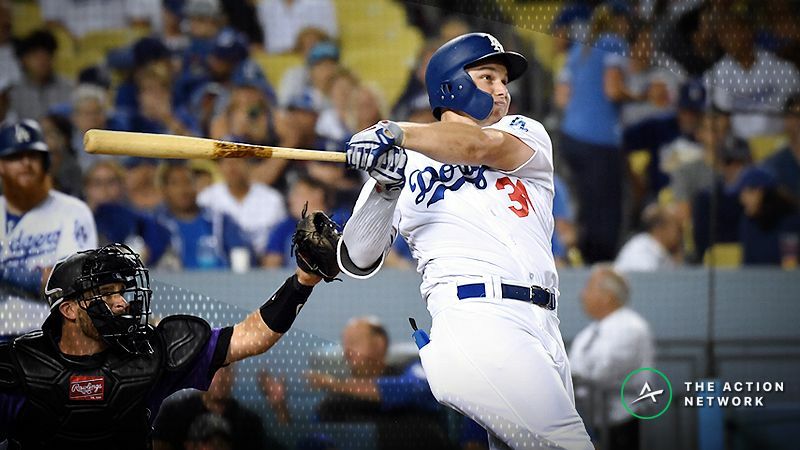 Dodgers outfielder Joc Pederson hit two home runs on Monday, helping Los Angeles top Colorado, 8-2. The victory put LA back in first place in the NL West. The offense has led the way all season. The Dodgers lead the National League in home runs (215) and runs (727), and, according to Fan Graphs, the Dodgers’ high-powered offense has generated the most WAR (27.8) in baseball this season. LA isn’t a lock to win its division like Atlanta and Houston are, but the -250 odds are easier to swallow. Plus, the Rockies could be without the services of All-Star Trevor Story, who left last night’s game with an elbow injury. Story is the first shortstop in MLB history with at least 40 doubles, 30 home runs and 25 steals.